Juvenile survival is the most critical component of large herbivores’ population dynamics. Thus, large herbivorous mammals are expected to maximize their population growth rates by optimizing their reproductive success through juvenile survival. Survival of calves is maximized when calving date and synchrony are well-adapted to the species’ environment. For instance, a short growing season for vegetation will promote a highly synchronized birth season to ensure that calves are born in most favorable conditions to grow and survive. To maintain this highly synchronous birth season, conceptions must also occur synchronously in time during the rutting season. Unfortunately, in a context of climate change, a ‘trophic mismatch’ may occur because climatic changes are faster than phenology changes of species, creating a situation where the peak demand for resources may now falls later or earlier than the seasonal peak of resource availability. Rangifer species is that thrive in a harsh and highly seasonal environment. 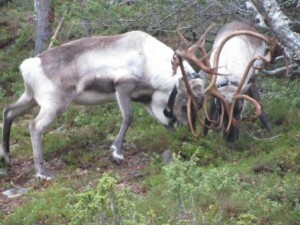 However, reindeer have not received enough attention in regard to the global change debate. 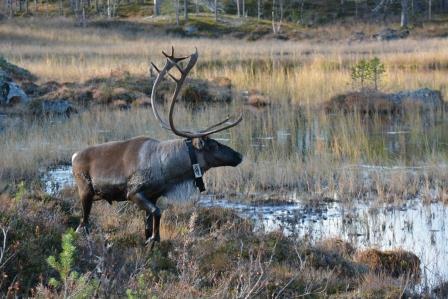 The aim of this study is thus to investigate if and how the reindeers’ reproductive phenology is evolving in the context of climatic change, e.g. by changing birthdates or onset of the rut period to adequately fit resources availability. I will first investigate effects of density and weather on the onset and synchrony of the rutting period. Then, I will focus on changes of the date and synchrony of the calving season in relation to both local and global climatic variables. 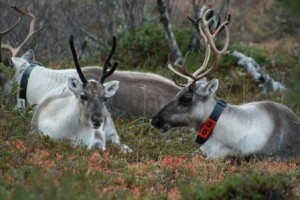 Finally, the future reindeer’s productivity will be investigated in regard to climate change. The field session will be held in the Kutuharju Field Reindeer Research Station in Kaamanen, Finland (69°N, 27°E) and will be conducted on a semi-domestic reindeer population. Each individual of the population can be identified with collars and the herd is free ranging for most of the year excluding the calving and rutting seasons. Consequently, we know which males have bred with which females and also the who is the father of individual calves. 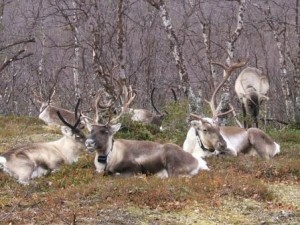 Information on the ecology and behavior of the individual reindeer are provided by the Finnish Reindeer Herders Association who manages and harvests these animals. The objective of my PhD is to investigate how reindeer respond to climate change by using data on their breeding and calving phenology (i.e. onset and synchrony) in relation with local and global climatic conditions. Paoli, C. Bonenfant, M. Hebblewhite and E. Merrill (2015) Adjustment of elk (Cervus elaphus canadensis) habitat selection in response to predation risk by wolves. 40e congrès annuel pour la Société Québécoise pour l’Étude Biologique du Comportement (SQEBC), 6-8 Novembre, 2015, Québec city, Québec, Canada (poster presentation). A. Paoli*, R.B. Weladji, Ø. Holand & J. Kumpula (2016) The proportion of males and female body weight influence the calving phenology of a semi-domesticated reindeer (Rangifer tarandus) population. Annual QCBS (Quebec Center for Biodiversity Science) symposium, December 14-16th, 2016, Montreal, QC, Canada (oral presentation).